The agent of Lazio star and AC Milan transfer target Sergej Milinkovic-Savic has dismissed any likelihood of a January exit materialising. The 23-year-old has had a slow first half of the campaign, scoring just three goals and providing one assist in 22 appearances in all competitions. Nevertheless, Lazio remain in fourth place in Serie A and continue to lead the race for the final Champions League qualification spot. Amid ongoing speculation of interest from Milan though, the Serbian international’s agent, Mateja Kezman, has now spoken out about his future and is adamant that he is not going to leave the Stadio Olimpico this month. 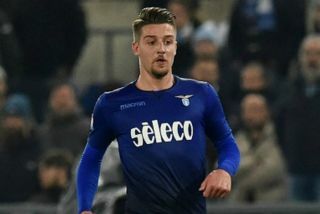 “Sergej is really happy at Lazio, he showed how much he loves the club and the fans by choosing to stay despite having many offers, he will not leave Lazio in this winter market window this is 100% sure. It is not fair to talk about his possible transfer every time,” he is quoted as saying by Calciomercato. His comments come after reports emerged that Milan could launch a fresh bid to prise him away this month, with MilanNews, via the paper edition of Il Messaggero, noting that an initial €9m loan deal with a €70m obligation to buy in the summer could be put on the table this month. However, given the two clubs are in direct competition for a top-four finish in Serie A, it would make no sense at all for Lazio to deprive themselves of an influential figure and strengthen their direct rivals in the same deal. As a result, Kezman’s outlook on the situation has to be considered accurate, and so it remains to be seen whether or not Milan launch a genuine bid to sign Milinkovic-Savic in the summer when perhaps all parties concerned could be more open to talks, as hinted at in his comments above.